Vidhi Jadeja here at Itsy Bity’s blog today. 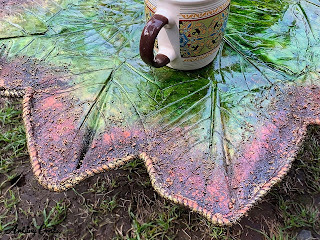 I am here to share a new experience of my crafting journey. I was super excited when I received this product from Itsy Bitsy; the newly launched Little Birdie Craft Cement! It is a wonderful product. You can try out so many different things with it. It’s a versatile product which can be used to create home decor, mixed media or fun kid’s projects. I love the idea of ‘Craft Cement’ as It is so much in vogue nowadays among designers and decorators. 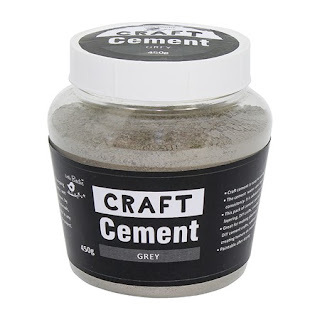 First of all, I will Explain a little bit about ‘Craft Cement’. The cement comes in a 450 gm jar. It is very easy to use by just mixing water. But it is advisable to mix water gradually. How much water? Well…that depends on what you want to create. It can be used for moulding, casting, layering, DIY crafts, creating textures and more. Great for making planters, bowls, candle holders, adding a hard textured layer on fabric etc. Take a look at what I made and read along to find out how I got there!! 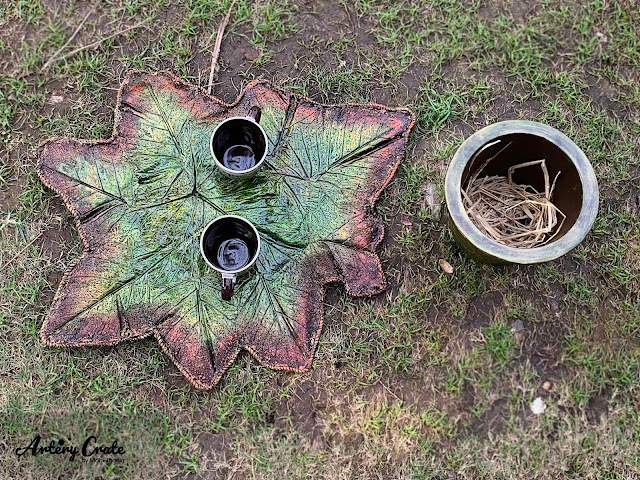 I have created a leaf shaped small table for my garden corner from this Craft Cement. As I wanted the table top to be slightly big in size, I needed 3 jars of Craft Cement. 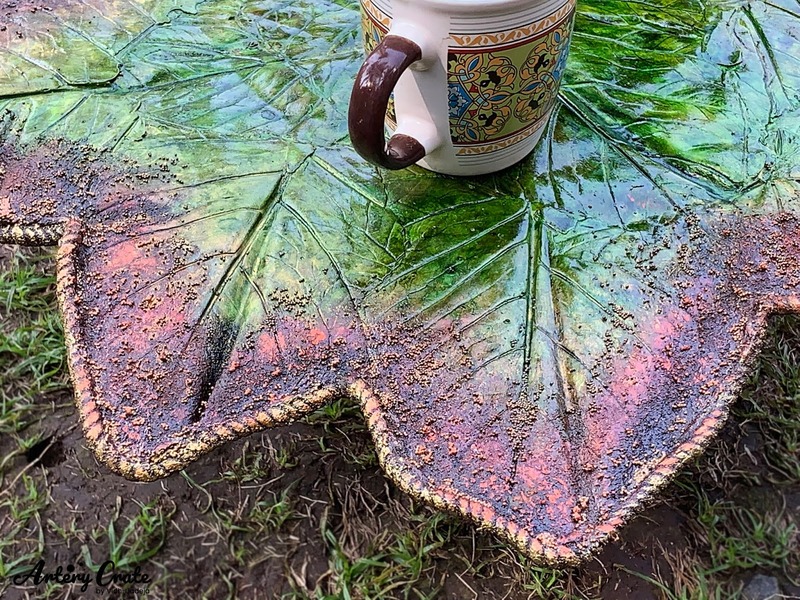 First, I bought some big leaves from the local market and arranged them on a plastic sheet the way I wanted my table to look. After that, I gradually mixed water in my craft cement in another bowl. As I didn’t want the paste to be too thin, I added little water at a time and made sure there were no lumps. When you are doing this, mix it well with your hands, wear gloves to protect your skin. When my paste was ready, I applied a layer of it on the leaves with my hands. After the first layer, I sprinkled a little bit of dry cement powder to make another layer. Poured one more layer of paste to make the surface a little thicker. Again, I sprinkled some dry cement powder to make the last layer. Allow the cement to rest for about 24 hours. Do not try to move or carry, till it completely dries. 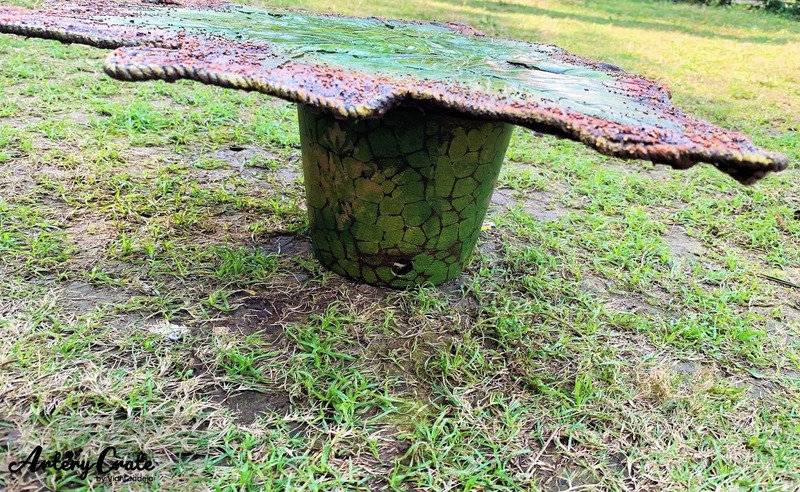 The next day when it was dry, I flipped it upside down and slowly lifted the leaves from the cement. I slowly removed all the leaves from the surface. Look at this, isn’t it looking gorgeous the way it is! Looks so natural, for a second I thought not to do anything with it. But I wanted to try so many different mediums on it… so I continued my journey. 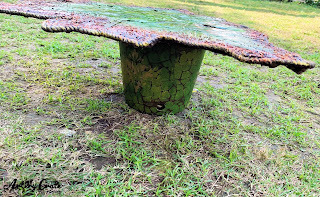 As I wanted to use this as my table, I need a solid and strong surface. So, I kept as it is for a day or two and sprinkled water on it 4 or 5 times a day to make it harder and free from unwanted cracks. The next step was to prime the surface before applying any further mediums on it. I glued a rope around the edges of the leaves to make it look more decorative and to protect it. After that, I applied white gesso on the surface. Next, I applied chalk paints from the store and little rust paste at the edges, to get my first layer of colors. After that got my sprays from the stash and applied a layer of it on chalk paints…for a shinier and glittery look. 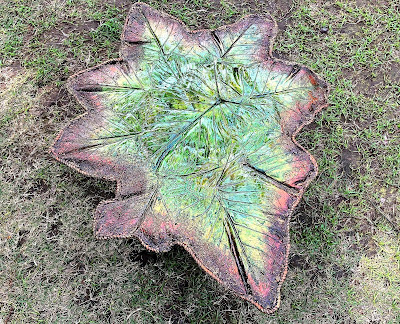 It enhanced the surface of the leaves! To create more interest and depth I added small golden and bronze beads at the edges of the leaves randomly. Dry brushed the edges with golden paints. For the base of the table, I took an earthen pot and gave a base coat of brown paint. With the help of stencils and colors, I added some patterns on the base of the pot to match my ‘Leaf’ table. I did not attach the pot to leaf table as I wanted to use the space inside the pot for storage. Voila! 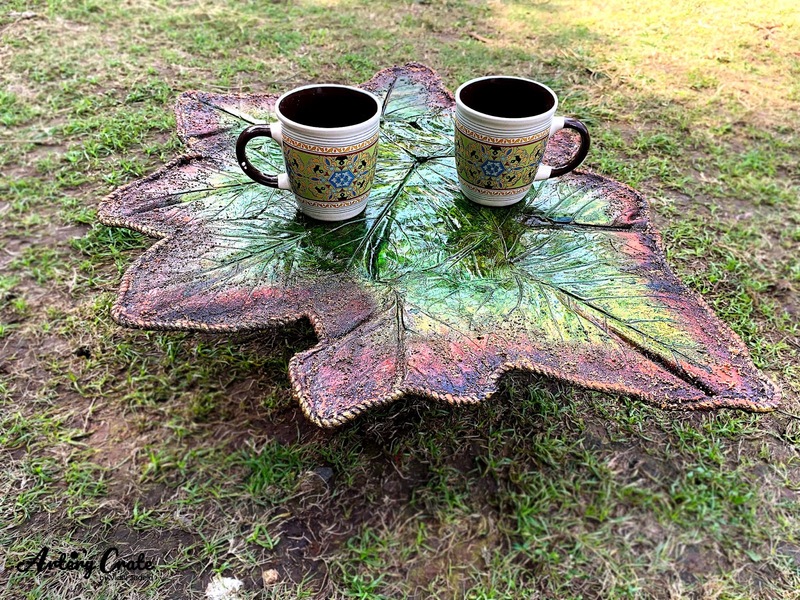 My beautiful table was ready to enhance my garden! Handmade stuff is always more precious and dear to us as it carries our love and feelings. It has more value rather than a ready-made one. Hope you guys like it and try something similar. First of all, it’s a must-have product if you want to try new ideas and DIY’s. It is very easy to use. Packaging is perfect for handling and storage. The price is pocket-friendly. Grey cement’s settling behavior and strength development are better than white cement. Cement is not be considered as a common material to be used in home decor projects but the beautiful texture makes it one of the most wanted product for all designers nowadays. The DIY Craft Cement has opened a wonderful opportunity for every crafter to tryout endless possibilities. So, please grab this wonderful product, give wings to your imagination and get started with your ‘Craft Cement’ project! Hope you enjoyed my project…..
Cant believe my eyes !! It such a marvelous project – loved the way the table looks in ur garden ! Must say very creatively used ! My dear…this looks fabulous. Thank you for sharing. Some doubts- Were u able to take out the leaves easily and Should we varnish after finishing such a project. Very creative.liked this post would love to try. Really liked your idea and the product u made. Commendable.